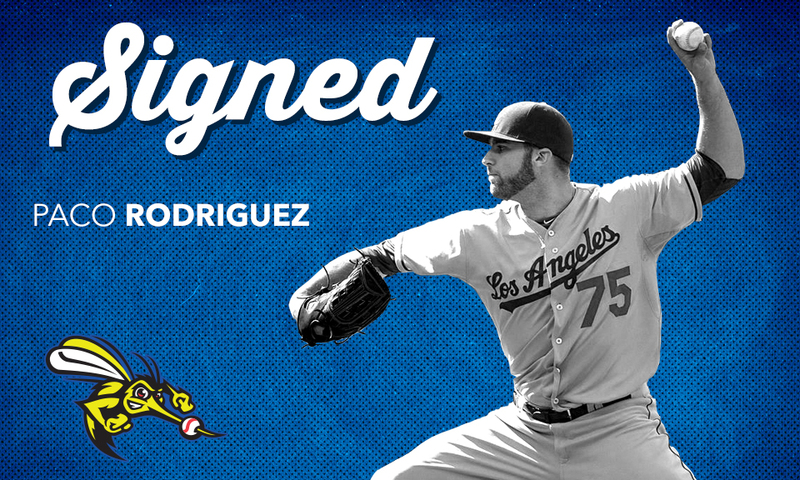 SUGAR LAND, TX— The Sugar Land Skeeters today announced that they’ve re-signed former Major League left-hander Paco Rodriguez. Rodriguez, 27, began the 2018 season with the Skeeters and appeared in three games, and was 0-0 with a 4.50 ERA and a save, striking out three batters over two innings pitched. Rodriguez is one of 11 players from the Skeeters 2018 roster to have his contract purchased from a Major League Baseball organization. The Minnesota Twins purchased his contract on May 2 and he went a combined 3-1 with a 3.48 ERA 22 appearances (four starts) and struck out 26 batters to 19 walks over 31 innings pitched. Prior to signing with the Twins, Rodriguez last appeared at the affiliated level in 2017 with the Baltimore Orioles’ Gulf Coast League affiliate. He was selected by the Los Angeles Dodgers in the second round of the 2012 MLB Draft out Florida and made his Major League debut that same year with the Dodgers, becoming the first player in his draft class to reach the Majors. He appeared on the Dodgers’ Opening Day roster from 2013-15 and was second on the team with 76 appearances in 2013. In 124 career Major League appearances (all coming in relief and with the Dodgers), Rodriguez is 4-5 with a 2.53 ERA and two saves. He’s struck out 91 batters to 30 walks in 85 1/3 innings in that span as well. Rodriguez was traded to the Atlanta Braves in July 2015 and underwent Tommy John surgery in September 2015. He did not make a professional appearance during the 2016 season and was released by the Braves in March 2017. Before attending the University of Florida, Rodriguez was drafted by the Houston Astros in the 48th round of the 2009 MLB Draft out of Gulliver Prep (Miami, Fla.). While at Florida, Rodriguez helped the team earn three consecutive appearances to the College World Series, including a trip the College World Series Finals in 2011. With the addition of Rodriguez, the Skeeters have 10 players on their active roster with Major League service time as he joins RHP Austin Adams, RHP Vicente Campos, RHP Jean Machi, C Derek Norris, RHP Felipe Paulino, OF Denis Phipps, LHP Dan Runzler, LHP James Russell and RHP Alex Wimmers. The Skeeters return to Constellation Field on Friday, Aug. 10, to begin a seven-game homestand against the Somerset Patriots. First pitch on Friday is set for 7:05 p.m. and a Friday Fireworks show will begin at the end of the game. The first 2,000 fans in attendance on Saturday, Aug. 11, will receive a Tracy McGrady Bobblehead Giveaway courtesy of Assured Flow Solutions, commemorating the Naismith Memorial Basketball Hall-of-Famer’s time with the Skeeters. McGrady is scheduled to throw out the ceremonial first pitch for Saturday’s game and the Skeeters will be raffling off autographed McGrady memorabilia to select fans in attendance. The first 1,000 fans in attendance on Sunday, Aug. 12, will receive a Skeeters Football Giveaway courtesy of Fluor as part of our Football Night. Fans can also enjoy our weekly promotions at Constellation Field, including Dollar Dog, Margarita and Military Monday, Two-Fer Tuesdays, Kids In Free Wednesdays, and Thirsty Thursdays.